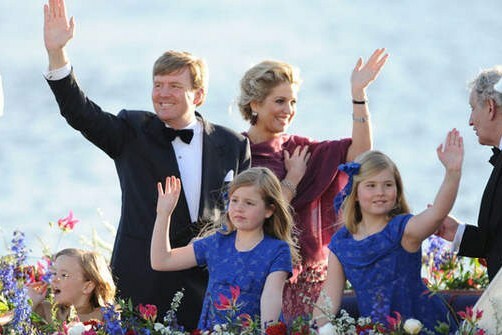 After the abdication and inauguration King Willem Alexander of the Netherlands and Queen Maxima third appearance today will be on a cruise on the river IJ in Amsterdam. Maxima choose for this appearance again for a gown by Jan Taminiau. After the royal blue you could see in my previous post, this time in bordeaux red lace. The young princesses didn't change, the small cape on top of the royal blue dresses is also by Natan.